4.2 out of 5 based on 16 bloggers and 3 commenters. 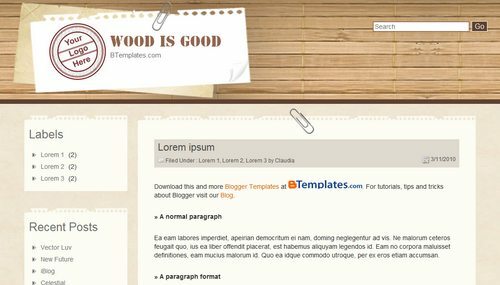 Wood is Good is a free blogger template adapted from WordPress with 2 columns, left sidebar and grunge style. You must change that image URL by yours. Your new image must be 127 px width and 125 px height. Hi, how can I make it one column? I want to get rid of categories, tags and all the suff on the left column.